Parque Centro América "Madre Tierra" is a school which offers more than high quality Spanish language instruction, there is also the opportunity to learn about the social, political and cultural situation in Guatemala. 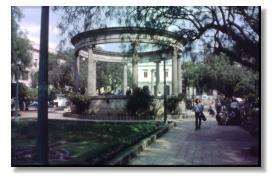 The school is located three blocks form the Central Park, in the historical district of Quetzaltenango. It is in an antique, colonial house with a garden patio and nice second floor views.